Mossms - End of Summer Sale! We're coming up on the end of summer. The kids are going back to school and we know that can get expensive so to give you a break we are discounting the 1800 food pack for one week! The sale starts immediately and will end at midnight SLT on August 20th, 2017. The normal price is 1035 L$ and the sale price is 828 L$. Breeding Challenges are Getting Even Better! Breeding Challenge Ears Are Done! WoW, April is Crazy! It's Time To Dance Like The Irish Again! Mossms 2016 Snowblowing Extravaganza Has Begun! Christmas Event Host SignUps Start Today! Halloween Is Approaching - We Need Your Help! Mossms Without Eyes?! 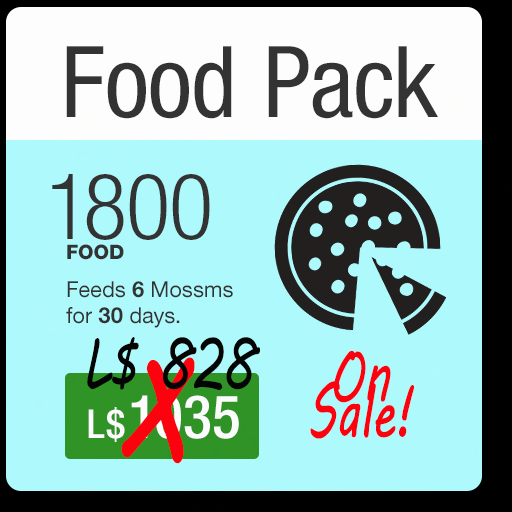 Weekend Food Sale and Perma Pet Pricing Change 3 Years! Woo Hoo!